Connecting the Dots will release its tenth design guide during the Dutch Design Week in Eindhoven. The Social & Green Design Guide, a coproduction with DOEN Foundation, provides a survey of all activities in the field of social and ecologically sustainable design in Eindhoven. It is striking how many socially committed projects are being presented this year, which shows that Social design is an important and topical theme. With this jubilee edition, Connecting the Dots and DOEN Foundation want to make a contribution to describing this new discipline whose contours are now slowly coming into focus. The guide with a map and a good route will be distributed as a full-colour newspaper in an edition of 8,000 and from 18 October will be available free of charge to every visitor to the Design Week. The theme number includes a pre-publication of a chapter from Looks Good. Feels Good. Is Good. – How Social Design changes our world, the latest book by Anne van der Zwaag, who has written several books and is director of Object Rotterdam. Also the book is a coproduction with Stichting DOEN. It is an accessible and interdisciplinary manual on Social Design that offers a good picture of a developing domain by means of background articles, interviews with designers, and surprising pilot projects from all over the world. 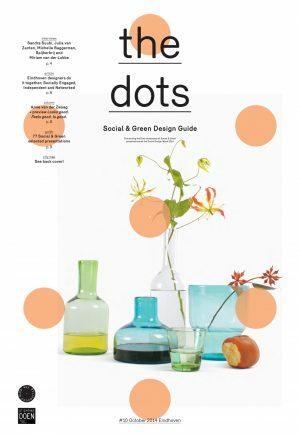 The theme will be locally pinpointed during Dutch Design Week in the Social & Green Design Guide of Connecting the Dots. That Social Design flourishes on the basis of forms of cooperation can be seen from the five interviews that Jeanne Tan conducted for Connecting the Dots. That is how Leonie Vlaar and Lois Stolwijk hit upon Spijkerbrij, a procedure by which even the most resilient pair of jeans can be turned into a new 3D object in their portable workshop. Anudando by Bureau Baggerman is full of contrasts, using plastic disposable bags to produce a thread from which long-life bags can be woven. Tan also held interviews with Sandra Suubi (Age of Wonderland), Van Eijk & van der Lubbe (Imperfect Design), and Julia van Zanten (Protective Underwear). Robert Andriessen interviewed the same designers on video. These interviews are distributed through the social media and can be found here. The tenth edition of Connecting the Dots is a joint production with BNO and DOEN Foundation.